Hand dyed thread for a baby blanket? Allergic to wool. Suggestions for dyeing? Can you dye yarn on finished garment? Has anyone ever tried to dye fun fur/eyelash yarn? 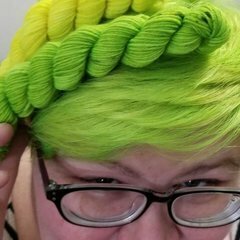 Does Kool-aid dye work on cotton yarn? My 2nd Attempt at Dyeing Yarn. will dye solve "old" problem? I wanted to play with koolaid too!